We ordered a custom-size version of this dress in grape for my daughter's prom. Customer service was very helpful in ordering and making sure it arrived in time. The dress fit perfectly and was comfortable and soooo beautiful! She got lots of compliments on the dress. I loved that my daughter looked & felt great wearing it, the dress was affordable, lovely and of great quality. This dress looks exactly like on the photo. It fits me perfectly. It arrived a bit later as planned because the package was retained in the custom offices. Fortunately, I did not have to pay any extra cost. I recommend this website. This dress looks exactly like the picture. I sent in my measurements and it fit perfectly. It arrived much earlier than expected. I'll definitely buy from here again! 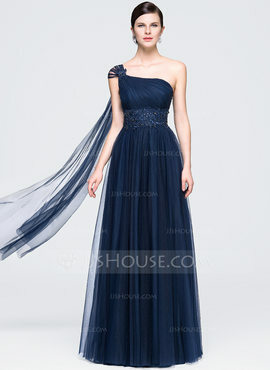 The dress came very quickly, and was exactly as pictured (I ordered the navy), and very nicely lined. The tulle was softer than I expected, which was a bonus. I ordered custom measurements, and wish I had shaved an inch or so off my bust measurement so that it would have worked better without a bra. Learning curve! This dress is absolutely amazing. Quality is beautiful. Very elegant. I received it really fast. I think I made an excellent choice to buy form your website. The dress fits me very well. I am so happy and we will definitely order again. Thank you! Very nice dress. The material lace is comfortable and looks expensive. I absolutely love the dress. The size is amazing. I would recommend this dress to my friends & family, for sure!